We now have a much better look at the new Michael Myers mask from the upcoming Halloween movie. Blumhouse and Universal recently debuted the movie's first trailer which has largely been met with a positive reaction from the horror community. They're ready for the return of the iconic slasher. This movie takes place 40 years after the events of the original and, though it's the same mask, it's clearly seen better days and looks quite a bit different. The folks at Trick or Treat Studios have recently released a screen-accurate replica of the new mask that is available for pre-order, offering a fresh view of the updated mask. The new Michael Myers Mask has been in full view on the poster for the new Halloween and was showcased plenty in the trailer. But this replica, which can be purchased for $59.99 and is available for pre-order now, offers an even better view. The pictures on the website give us easily our best look yet and it's crazy how much detail is included. It helps that the mask was not only officially licensed by Miramax, but also sculpted by Oscar-winner Christopher Nelson, who worked on the mask for the new movie. Here's what Trick or Treat Studios has to say about the mask on their official site. "Trick or Treat Studios is proud to present the Officially Licensed Halloween 2018 Michael Myers Mask from the upcoming film Halloween 2018 opening October 19th 2018! 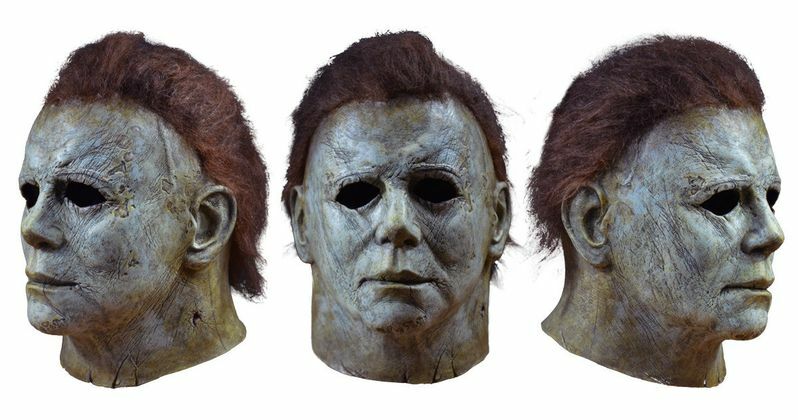 This mask comes directly from the movie master and is an exact replica of the mask worn by Michael Myers in Halloween 2018." If you're even thinking of going as Michael Myers for Halloween this year, it's hard to imagine doing any better than this mask. It's easy to see just much attention to detail was paid as the mask not only has the marks of time on it, but there is even a neck hole where he was stabbed in the original 1978 movie. Great care was taken here. Nick Castle, who originally portrayed the masked killer in John Carpenter's horror classic and was famously credited as The Shape, returns for the new movie. He won't be handling all of the duties though, as James Jude Courtney has also been tapped to bring the killer back to life on the big screen. This new movie serves as a direct sequel to the original and will be ignoring the events of every previous entry in the franchise. David Gordon Green directs the new Halloween from a script he co-wrote with Danny McBride. Jamie Lee Curtis is also back as Laurie Strode, with John Carpenter executive producing and providing the movie's score. If you want to get your hands on one of the masks, the company warns to do it quickly as they'll likely sell out fast. The masks are expected to ship in September or October. You can check out some stills of the mask, courtesy of Trick or Treat Studios, for yourself below.